It is the year 2009. Killer robots rampage through the streets, aliens rain down destruction from the sky, and a two-millennium old prophecy which could determine the fate of the world is coming to fruition. The most unpopular President in America's history has taken the White House, leading to heretofore unseen levels of civil unrest. On the island of Ibis, experiments with Third Energy technology have brought bloodthirsty long-extinct reptiles forward through time. The Allied Nation Task Force has invaded North Korea after a ruthless general with a cache of nuclear weapons at his disposal took over the country, and an untrained member of an elite military taskforce prepares to enter an offshore clean-up facility on a mission to rescue some very important hostages. This isn't a 2009 one would find plastered across CNN or debated on Fox News. None of these events have happened or will happen, but to some of us they're even more familiar than reality. This is the 2009 that countless gamers have experienced on their computers or via their consoles since 1987 – more than twenty years worth of 2009. 2009 is already shaping up to be an eventful year in real-world history. The first black president in American history has taken office. The global economy is in a shambles. Violence continues to plague the Middle East. Satellites are colliding in space; a massive earthquake has ravaged parts of Italy; and real-life Somali pirates are running rampant. Though the world may seem like an increasingly dark and dangerous place, it could be a great deal worse. Just take a look at some of the major events that have occurred in video games set in 2009. Writing games based in the future is very much like throwing darts. The closer you get to what you're aiming at, the more accurate you become. A game based in the year 2009 written in 1987 is bound to offer a much wilder interpretation of what the world looks like than one written in the year 2000. It's a phenomenon we like to refer to as the reality curve, readily demonstrated in the games that portrayed 2009 as an age of highly advanced technology. 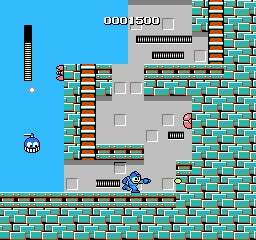 Mega Man (Capcom 1987 - Nintendo Entertainment System): Mega Man fans will argue back and forth for hours concerning the actual dates in which the various games in the series take place, but we've decided to take a far simpler approach. With the first three games taking place in the year 200X, it's pretty safe to assume that at some point this year in the video game universe, Dr. Wily has unleashed another army of evil themed robots, each with their own specific strengths and weaknesses for the titular blue bomber to exploit, such as "Allergic To Squirrels Man" and "Shoot Me Right Here Man". Dino Crisis (Capcom1999 - PlayStation 2, Dreamcast, PC): Renowned scientist Doctor Edward Kirk, thought dead for years, turns up alive on the island of Ibis, where his experiments with Third Energy technology have resulted in a rift in time and space, which allows vicious dinosaurs to invade. This is exactly what happens every time a scientist pokes about with time. You'd think they would have learned this by now. Incoming (Interplay 1998 - PC, Dreamcast): In 2008, aliens attack our lunar base. By June of 2009, we're prepared to strike back. A rather straightforward vehicle shooter from Rage Software, Incoming presents a rather optimistic view on how the people of the world would react to alien invasion. In reality we'd need to form several committees and commissions to investigate the nature of the threat and countries would argue over who got the first shot at the invaders. Eventually the whole situation would be resolved by Naval snipers. Abuse (EA, Bungie, Red Hat 1996 - PC): In this 2D shooter, protagonist Nick Vrenna becomes falsely imprisoned in a facility where scientists are experimenting with a nanotech virus called "Abuse". A riot occurs, turning the prisoners into monsters, but luckily our hero is immune. Fancy the only man immune to a terrible virus winding up at the same prison where the virus is accidentally released. What are the odds? War never changes. If this is true, why bother setting a game with a war setting in the near future? For some titles it's a simple matter of keeping up with a pre-established chronic logical order. By the time Metal Gear Solid 2: Sons of Liberty was released in 2001, the previous title in the series had already established events up to 2005, so 2007 and 2009 were used to advance the story. Another reason to give a military-themed story time to breathe is to distance it from current world events. The first nine years of the 21st century have seen more than their fare share of major terrorist acts and armed conflicts. Setting a game even a few years in the future, as was the case with Rainbow Six: Lockdown, adds a much-needed air of fiction to the proceedings. Mercenaries: Playground of Destruction (LucasArts. 2005 - PS2, Xbox): Mercenaries takes place in an alternate North Korea, after the ruthless General Choi Song leads a successful coup against his father President Choi Kim in order to keep the country from reuniting with South Korea. The revelation that Song is stockpiling nuclear weapons causes the Allied Nations Task Force to step in and topple his regime, only to have Song himself escape with the launch codes for missiles currently under production in secret locations. The player takes the role of a mercenary, tasked with tracking down Song and his secret underground army before the weapons are ready to launch. Mercenaries effectively uses the four year time jump along with the change of location to help distance events in the game from events in Iraq and Afghanistan that influenced the development, though certain similarities still shine through, such as the use of the "Deck of 52" to keep track of Song's henchmen. Major movers and shakers in Song's organization are represented by face cards from a deck of cards, much like the system Coalition forces used in Iraq while tracking down members of Saddam Hussein's government. You can hardly blame them - the concept has major motion picture written all over it. Army of Two (EA, 2008 - Xbox 360, PS3, PC) : The story in EA's Army of Two actually spans sixteen years, from 1983 to 2009. Over the course of the game the pair slowly uncover a plot to privatize the military, leading to a final confrontation in Florida between the mercenaries Elliot Salem and Tyson Rios and their commander at the Security and Strategy Corporation headquarters. Rainbow Six: Lockdown (Ubisoft, 2005 - PS2, Xbox, Gamecube, PC): The anti-terrorism theme has been quite the popular one this decade, for obvious reasons. Rainbow Six: Lockdown is an excellent example of how a game uses a near future setting to sidestep association with current events. In the year 2009, counter-terrorism unit Rainbow must stop the Global Liberation front from unleashing a man-made nanotech virus called "Legion", which has a mortality rate of "Yes". Team Rainbow triumphs in the end, once again keeping the world safe for squad-based shooter players around the globe. Metal Gear Solid 2: Sons of Liberty (Konami, 2001 - PS2): Chronologically the fifth game in the wildly popular Metal gear series, Sons of Liberty actually begins in 2007 with Solid Snake, only to jump to 2009, putting players in control of the wet-behind-the-ears Raiden as he takes on a mission to rescue the president and other hostages from the Big Shell cleanup facility. Raiden eventually learns a great deal about himself, the shadowy Patriots, and how to get around a gigantic enemy fortress while covering his private parts, eventually foiling a terrorist plot to take over New York City. The time jump in Sons of Liberty's instance, was the combined result of established continuity and series creator Hideo Kojima's diabolical plan to replace Solid Snake with a naked blond man. Shattered Union (2K Games, 2005 - PC, Xbox): 2009 is just the beginning for Shattered Union, a turn-based tactical game from PopTop Software that based a "What if?" scenario on the oft-challenged results from the 200 and 2004 presidential elections. What if the wrong man for the job had been elected? David Jefferson Adams is sworn in as the 44th president of the United States at the beginning of the game. This leads to a large amount of civil unrest and, eventually, domestic terrorism. The assassination of the president via low-yield tactical nuclear weapon after his second term begins in 2013 leads to the second American Civil War, which the Europeans and Russians can't help but get involved in. You know how those Europeans are, always interfering with international affairs they have no business in. Unexplained supernatural phenomenon has always been a cornerstone of fiction, and interactive fiction is no different. So pervasive are tales of ghosts and spirits in our society that the theme can be transplanted into any setting, from a Victorian-era vampire tale to monstrous aberrations in the depths of space. Despite having the entirety of human history and beyond to choose from, many game developers choose to set their scary stories in the near future or present day. Why? It's a simple matter of familiarity. It's much easier to stir strong emotions or present a believable setting for supernatural goings on when the player is somewhat familiar with the world in which the events take place. Even better, setting a horror or suspense story a few years in the future allows the developer to intersperse the unfamiliar with the familiar, adding to the player's unease almost imperceptibly without taking them out of the experience. Resident Evil 5 (Capcom, 2009 - PS3, Xbox 360): Capcom has done an excellent job thus far of keeping their Resident Evil series up to date with reality, hence Resident Evil 5 being the only title in the timeline actually released in 2009. This almost means that it's one of the more realistic games set in 2009, despite the bio-terrorism angle. The current day temporal settings along with the remote locations games in the Resident Evil series traditionally take place in add a certain sense of realism to the survival horror franchise. On one hand, the events depicted in the game could almost certainly never happen. On the other hand, if they did happen, would we know? Shin Megami Tensei: Persona 3 (Atlus, 2006 - PS2): In a modern Japanese city, a group of high school children do battle in the space between one day and the next in order to prevent the end of the world. The player plays the role of the nameless protagonist, returning to the city after 10 years and joining the Specialized Extracurricular Execution Squad, a group consisting of teens that remain conscious during the Dark Hour, a secret time between days infested with shadowy creatures. For North American players, Persona 3 was a role-playing game mixed with a quirky time-management school activities. For Japanese players who could better relate to the school structure presented in the game it was something a bit more personal, heightened by the near-future setting. Left 4 Dead (Valve - PC, Xbox 360): Does Left 4 Dead take place in 2009? The writing is on the wall, literally. Scribblings on the walls in certain levels give us our only hint to the purposefully story-light setting of Valve's co-operative survival horror masterpiece. All we know is that somewhere in Pennsylvania something terrible happened, the dead walk the Earth, and you've got to make your way to safety. The date in this case is almost inconsequential. Instead of blasting us with heaps of story based in October, 2009, Valve has left it completely up to the player to decide what events led to their predicament, which should make October of this year quite interesting for fans of the game. Indigo Prophecy (Atari, 2005 - Xbox, PC, PS2): Indigo Prophecy begins in January of 2009, where a series of grisly murders is being perpetrated by citizens seemingly possessed, driven to mercilessly slaughter innocent strangers. What begins as a crime drama quickly becomes a supernatural thriller, culminating in a series of events that will change the face of the world forever. Over the course of twelve months, the end of the world has been narrowly averted on five separate occasions; six major threats to the Earth's security have been neutralized; and the United States has been set on a course that will eventually lead to a new Civil War. On top of all of that, Dr. Wily's evil robots have spent the better part of the year raining down specifically-themed destruction. Technological advances have served us well in the defense of the planet against evil robots and invaders from outer space. Unfortunately, at the same time they've also resulted in the creation at least three different deadly viruses, several different flavors of robotic war machines, and the temporal displacement of flesh-hungry dinosaurs. Technology also could have been the cause of the zombie uprising in Pennsylvania, though no reporter dare get close enough to investigate, even if they have covered wars, you know. The worst thing about all of these tragic circumstances? For the most part each one is the result of some sort of human failing. Greed, over ambition, lust for power, scientific irresponsibility - we brought all of this on ourselves. The only possible exception is the alien attack, but knowing humans we probably did something to tick them off in the first place. It's what comes from being the top of the food chain (not counting aliens and dinosaurs). With no natural enemies, we have to create them ourselves. 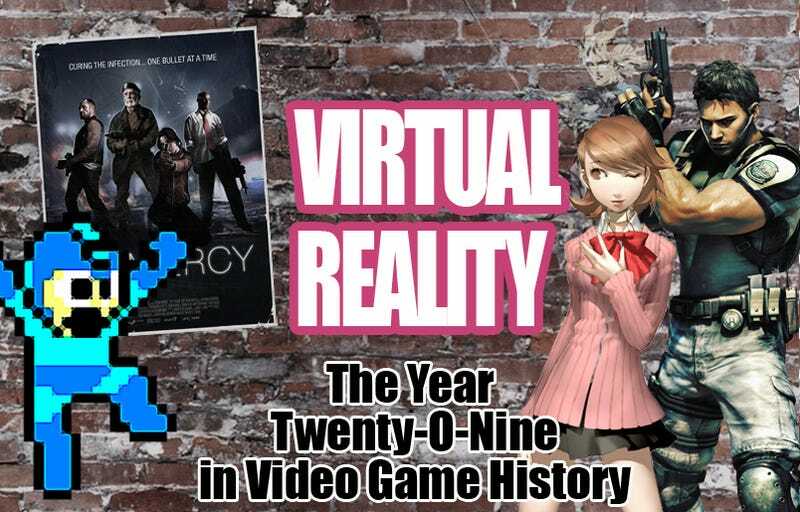 While 2009 was certainly an eventful year in video game chronology, we have to keep in mind that this is just one period of 12 months in a period that spans the whole of human history and far into the future. Just last year a plumber from the Mushroom Kingdom and his friends faced off against a group of anthropomorphic animals on Sonic and Mario at the 2008 Winter Olympics, and next year the fragile peace between the fictional nations of Osea and Yuktobania erodes in Ace Combat 5. Not to mention more killer robots. Imagine the same sort of timeline as above, only covering the entire history of video games taking place or involving both real and alternate versions of the planet Earth. How many wars have been fought, invasions repelled, epidemics prevented, mysteries solved, and conspiracies uncovered? Creating such a timeline would be a truly massive undertaking, but one that would grant us tremendous insight into what the sort of shape the world would be in if the entertaining diversions we've enjoyed over the years had basis in fact. For now we leave such ambitious projects for more idle hands, drawing what conclusions we can from the data we have before us. The conclusion? 2009 was not a good year to be a video game character.